Ties are ready to be installed to carry the new line across Main Street. It will bypass the UP mainline at right. Passersby can see that work has resumed on the so-called Santiam Lead, a stretch of new railroad track parallel to the Union Pacific Mainline in Albany. High time, too. Under an agreement between the Portland & Western Railroad and ODOT-Rail, the project is supposed to be completed by Dec. 31. 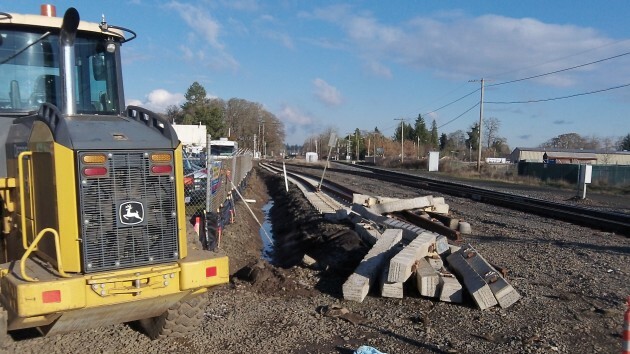 Unless another extension has been worked out, the Portland & Western has three and a half weeks to complete the new track over a distance of about three city blocks, from just west of Santiam Road across Main Street to the Santiam Wye at Madison Street. Heavy equipment has been working at the site, and a survey crew from K&D Engineering of Albany was working at the Madison end on Tuesday. Keep in mind with all R/R crossings, the R/R considers that we, the public, are crossing their private property. Stems from long ago when the R/R’s were given vast tracts of land with the requirement they develop a people transport system. Lot of good that did as the present Amtrak is so heavily subsidized. Maybe we ought to reconsider that deal & make it so the R/R’s cross OUR pubic property & pay accordingly. Nothing but nothing comes to Albany by rail these days anyway.